Flexible Foam Interfacing: A Whole New World of Sewing! If you have been into sewing from a while now, I’m sure you have come across those amazing Vera Bradley bags that make you want to part with your money irrespective of their price tag. And one of the most important reasons you find them so appealing is their feather-weight structure, and the ability to hold their shape despite being surprisingly lightweight. Some of you may have tried to find out how to make them, but most likely without success. Well, making them seems to be more of a secret among the sewing community, but it won’t be anymore, as you will learn in this post everything about it that you need to make them at your home for a fraction of the cost of what you end up spending on them from time to time. However, it’s not just those cool bags that you would be making using flexible foam interfacing, but also a lot of other cool things. 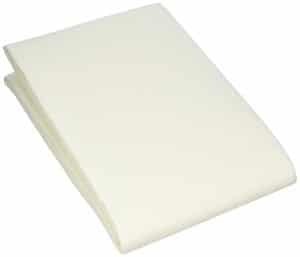 Flexible foam interfacing is basically a product like this one right here. It’s actually something that comes with an amazing combination of foam, fusibility, flexibility and an ability to be super lightweight, and uses them to pave the way for a type of interfacing that allows making super cool bags, totes and many more products like the Vera Bradley bags we talked about above. The foam part is sandwiched between two layers of fabric that are super soft and extremely thin. Most flexible interfacing products are made of polyester, which allows them to be long-lasting, not shrink when used over a long period of time, as well as be washable. There are mainly two types of these products – the sew-in ones and the fusible ones. One of the best things about flexible foam interfacings is that you can squish them in any direction and for any length of time, but they will regain their shape right after being released. This kind of flexibility allows making things much more functional, flexible and durable than they would be when made using some other type of fabric. Foam interfacing’s flexibility and ability to not lose its shape makes it an incredible material for making things like bags, Tiny Tony Totes, fabric baskets and pretty much anything that could do with a lot of flexibility. Many times, sewers tend to use fusible fleece when making bags. And although it works fine most of the time, the crinkling that’s a result of it getting fused to the fabric is something inevitable. It’s also nowhere near as soft and flexible as something made using foam interfacing can be. Making bags or any other similar items using fusible fleece is also very challenging as it gets bulky and even some of the more powerful sewing machines find it difficult to keep up with it. However, with foam interfacing, you can scrunch, squish or do anything to the bag to make it lose its shape and it will bounce right back into its shape. This also makes it stand upright on its own, which is otherwise a near-impossible thing to do with bags. Similarly, things made using foam interfacing also help save a huge amount of space when traveling, as they could be crushed to take up as less space as possible. They also weigh way less than they would if made using other materials, and are very soft and comfortable to carry. While there are many other advantages of using foam interfacing, one of the more important of them is that it gives the things you make using it a professional look and feel, something that you usually only get with the more expensive products on the market. While flexible foam interfacing is a wonder product when it comes to sewing – and will help you make incredible things – there are only a few brands that offer it. So it makes sense to walk you through some of the best ones, while giving you an overview of what they have to offer. If you’re looking to make a bag using foam interfacing, then Soft and Stable would be right up your alley. It comes with a silky feel, prevents the end product from getting stiff, and works great at making bags and other things with a professional touch. 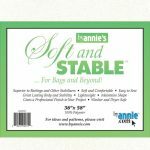 It’s also one of the more durable options on the market, which makes it ideal for making things like makeup and toiletry bags, planner cover, travel totes and more. 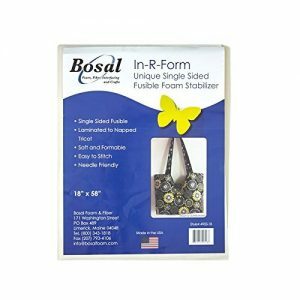 Bosal In-R-Foam has its own unique set of advantages to offer, including being denser and sturdier than the Soft and Stable interfacing. This allows it to hold its shape, as well as make the products made using it to stand on their own better. I think it would be one of the better options when making larger bags, Tiny Town Totes, fabric baskets and many other things, especially including the ones that need to stand on their own. It also offers quite a variety of fusible options, including one-sided fusible, two-sided fusible, as well as sew-in. This means that no matter how specific your needs are, one of the three options may fit the bill perfectly for you. First things first, Pellon Flex Foam offers the same options that the product above does. It, however, isn’t as soft as the other two products we discussed above. In fact, it’s the thickest of the three. That said, it’s also the least expensive of them all, and is available more easily than the other two. In other words, if the thickness is not a problem for you and you’re on a tight budget, the Pellon Flex Foam may turn out to be your best bet. It may actually work better for making things that will be subjected to a lot of wear, including backpacks, everyday bags, as well as even tablet or binder covers, among others. If you’re not an expert at sewing, you may feel that using foam interfacing may turn out to be more challenging than what you can handle. Well, let me tell you that’s absolutely not the case. Foam interfacing is very simple to use, and once you get the hang of it, you will have no difficulty making super cool, even some of the larger things using it. If you make mistakes when working with it, you would be able to correct them easily without messing anything up. Making something like a simple quilted placemat may be a good option when you’re just starting off with it, and take things to the next level once your creativity kicks in. Grab yours today at Amazon.com!